Located on tiny Loon Island in Lake Sunapee, near the entrance to Sunapee Harbor. Loon Island is a small rocky island in the middle of Lake Sunapee. The area around Loon Island is very rocky in shallow waters with ledges surrounding the area. In 1891, the steamer Edmund Burke struck a ledge that was hidden in the shallow waters by Loon Island. Although there were no casualties, the accident led to the locals petitioning for a lighthouse on Loon Island. Two owners of the steamboats that ferried many of the tourists and cargo around the lake, the Woodsum Brothers, for the safety of their own boats and locals alike, decided to build three lighthouses at strategic locations around the lake. A wooden tower was built and named Loon Island Light in 1893 by the local steamship owners. In 1896, the local fire department was repairing the lighthouse when it caught fire. The firemen had one bucket and put out the fire with the surrounding lake water. The second tower was struck by lightning in 1960 and burned down. It was rebuilt in the same year, after a fund drive for private contributions. In the 1980s, solar panels were installed in the lighthouse. Visitors will find this roughly two-hour detour from the New Hampshire seacoast a unique scenic and rural area of the western side of New Hampshire. Lake Sunapee is a favorite for those who want a quiet rustic vacation. Sunapee Harbor is very rustic as if stuck in time. 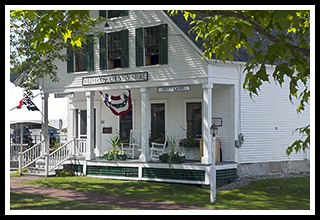 It has a quaint country store and a few specialty shops, artists' galleries, restaurants, and entertainment. The Lake Sunapee region is named for the spectacular lake and the mountain that rises from its southern shore. 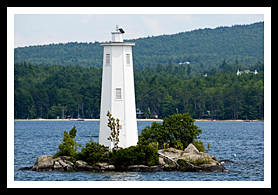 Nine miles long and three miles wide, Lake Sunapee’s rocky shore with its three working lighthouses also contains many private and public beaches, especially the public beach at Mt. Sunapee State Park. You can also hike some of the well-marked trails on Mt. Sunapee, which is also a favorite skiing spot in the winter. Each August the State Park is the site for the nation's oldest crafts event, the League of New Hampshire Craftsmen's Fair. The area surrounding Lake Sunapee contains some of the largest collections of covered bridges in the neighboring towns of Cornish, Newport, Meriden, Bradford, and Warner. Only two out of an original thirteen Concord & Claremont Railway Company covered railroad bridges still exist in Newport, just west of Sunapee. These remaining bridges are the Wright’s Bridge and the Pier Bridge (also referred to as Chandler Station Bridge). These bridges, which are located along the Chandlers Mills Road, cross the Sugar River and help create a portion of the nearly ten mile ‘Sugar River Rail Trail. At nearly 217 feet long, the Pier Bridge, which was built in 1871, is the longest covered “railroad bridge” in the world. 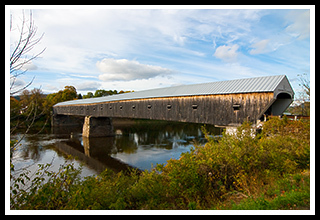 For those who want to see the longest “covered bridge” in the United States (449 feet, 5 inches), the Cornish-Windsor Bridge is a short distance west of Sunapee. It connects the New Hampshire and Vermont borders crossing the Connecticut River. The Old Fort at No. 4 is a living history museum in Charlestown to give visitors a glimpse of life on the frontier between New England and New France from 1740 to 1760. All three lighthouses on Lake Sunapee are best viewed by boat. Coming up from the south take Route 89 to Exit 12A. Take a left at the end of the exit ramp. Coming down from the north take Route 89 to Exit 12A. Take a right at the end of the exit ramp. At the first light take a right onto Route 11, follow for three miles. Take a left at the blinking light, go up and over the hill. The M.V. Kearsarge, which includes dinner cruises, runs various tours that go past the lighthouses. The M.V. Mt Sunapee runs a lighthouse and nature tour every day in the summer. 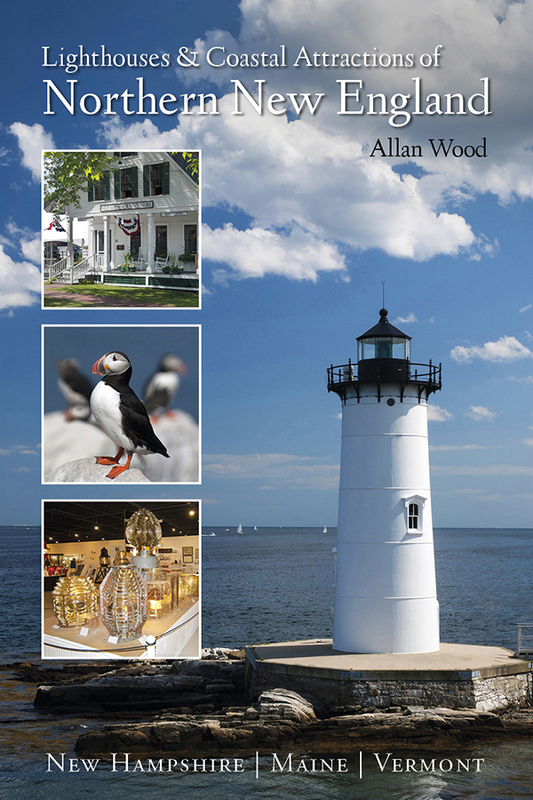 My 300-page book (with over 360 images), Lighthouses and Coastal Attractions of Northern New England: New Hampshire, Maine, and Vermont, provides stories from each of the 76 lighthouses, along with plenty of coastal attractions and tours near each beacon.